On the one hand, it is of course a stroke of genius to sample a Kate Bush vocal for a single, because all people with good taste will appreciate anything incorporating Kate's vocals. On the other hand, is Kate Bush's delicate music suitable for this kind of techno house stuff? I always had doubts about this - and I still do. 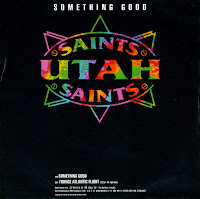 'Something good' by the Utah Saints utilises a sample of Kate Bush's 'Cloudbusting' to make a whole new track. And it is a 'track', not a 'song', unfortunately. The single peaked at number 4 in the UK and Ireland and number 10 in Australia. The track was recently remixed and re-released as 'Something Good 08'. In that version, it made the Dutch Top 40, peaking at number 34. 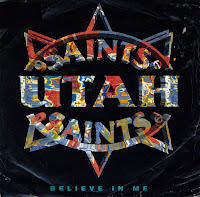 Jez Willis and Tim Garbutt formed Utah Saints in 1990. Early on in their career they had a few hit singles in what they call their 'vocal sample trilogy', of which this one, 'Believe in me' is the third. It features a sample of the Human League's 'Love action', whereas the B-side, a remix of the first part in the trilogy 'What can you do for me', with a sample from the Eurythmics' 'There must be an angel (playing with my heart)'. The single did not chart in the Netherlands, but peaked at number 8 in the UK singles chart. I bought the single because of the Human League sample. When you listen to this track you quickly realise that the guys forgot to make a song.